If there was ever any doubt about what might be in store for the Volkswagen Group following its recent emissions scandal, a glance at the banking industry over the last five years offers a sobering clue. It is nearly seven years since many banks were deemed too big to fail during the financial crisis of 2008 and 2009. The price of being rescued, and for bringing the global economy to its knees, was regulation on a scale never previously experienced. In the wake of this increased regulatory oversight, a series of mis-selling and rate manipulation scandals have cost the banking industry billions of pounds in fines, civil settlements and legal fees. Only now, some years later, is there even the slightest expectation that the worst is in the past, or at the very least out in the public domain. 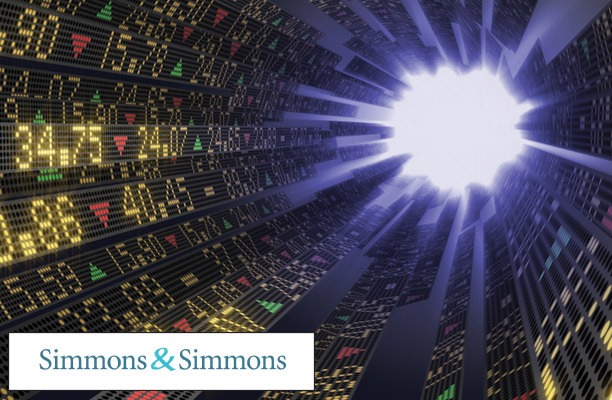 To better understand the financial industry’s current attitude towards regulation and litigation, Legal Business teamed up with Simmons & Simmons to survey senior in-house disputes and regulatory lawyers at major banks, asset managers, hedge funds and other financial institutions. We also interviewed senior general counsel (GCs), barristers and high court judges to find out where they feel regulation and litigation are headed, and what sort of infrastructure and mechanisms have been put in place to better manage these risks. For financial institutions, unquestionably, the burden of regulation and litigation will remain heavy for the foreseeable future. 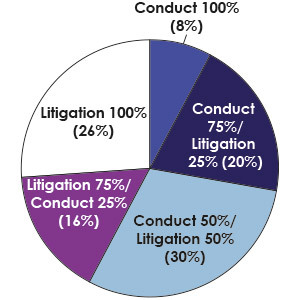 Eighty-eight percent of respondents to the survey have been involved in a formal dispute since 2013 (when we last surveyed the in-house banking litigation community), while 68% have experienced a regulatory investigation. This is illustrated by the growth in UK civil claims involving major financial institutions, and the larger fines handed out by the Financial Conduct Authority (FCA) and its predecessor the Financial Services Authority (FSA) (see ‘Ten years of FCA and FSA fines’ and ‘Significant litigation involving major financial institutions’ below). For litigation, the number of claims involving financial institutions climbed from 95 in 2008 to 192 claims in 2014. 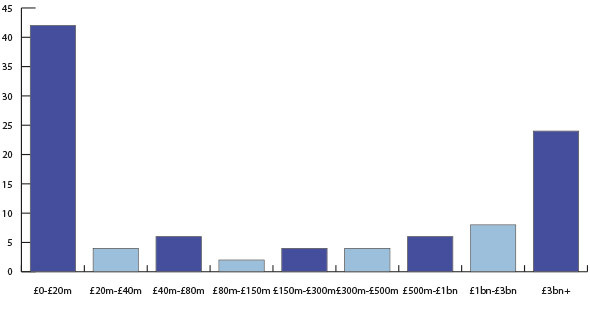 The contrast in regulatory fines is greater still: in 2007, the FSA handed out £5.3m in fines, just 0.36% of the £1.47bn that the FCA issued in 2014. Fines for 2015 currently stand at £826.9m, which includes a record fine of £284m given to Barclays for ‘failing to control business practices in its foreign exchange (FX) business’. How many formal disputes (including arbitrations) has your institution been involved in since 2013? 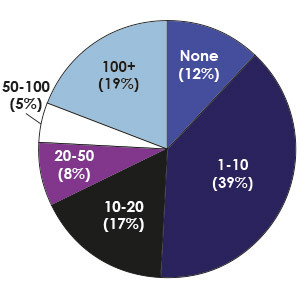 How many regulatory investigations has your institution been involved in since 2013? What do you envisage will be the balance between conduct and litigation matters? Barclays’ annual reports illustrate the growing significance of its various regulatory and legal proceedings. In 2007 they merited a page and a half in the ‘Notes to the Financial Statements’. By 2014, coverage had ballooned to over 11 pages, plus a significant mention in the chief executive’s review. The notes included a £5.2bn provision against the cost of payment protection insurance (PPI) redress; £1.5bn for ‘Interest Rate Hedging Product redress’; and £1.25bn held for ‘ongoing investigations’ and ‘litigation relating to Foreign Exchange’. According to a Reuters report published in May, 20 of the world’s largest banks have paid £151.7bn in fines and compensation since 2008. Roughly 60% was linked to mis-sold mortgages in the US, while nearly 20% was linked to the mis-selling of insurance products in the UK, such as PPI. While the growing importance banks and financial services place on their in-house disputes and regulatory teams is unsurprising, given the huge regulatory burden that they now face, the speed of that growth has been startling. In the case of many banks, a vital in-house legal function that is now taken for granted barely existed in 2007. The development of Barclays’ global litigation function, following the appointment of Bob Hoyt as general counsel (GC) in 2013, illustrates the strategic importance that litigation and regulation have to the bank and to the wider industry as a whole. Whereas in the past, separate litigation heads at Barclays were spread across separate business units, now there is one, Stephanie Pagni, who was appointed head of litigation, enforcements and investigations in May 2014 and reports directly to Hoyt, sits on the legal executive committee and is a member of Barclays’ senior leadership group. Since Hoyt’s arrival, there has been a changing of the guard at Barclays. Several senior lawyers have left, including deputy GC Michael Shaw, who departed in September 2015, and Barclays corporate and investment banking global GC Judith Shepherd, whose exit was announced in January. Others have taken jobs elsewhere, such as former EMEA GC for Barclays Investment Bank, Erica Handling, who is now EMEA GC at global asset manager BlackRock. Meanwhile, the bank’s former global head of financial crime legal, Jonathan Peddie, joined Baker & McKenzie as a partner in its corporate investigations group after leaving the bank earlier this year. The in-house merry-go-round hasn’t been exclusive to Barclays. 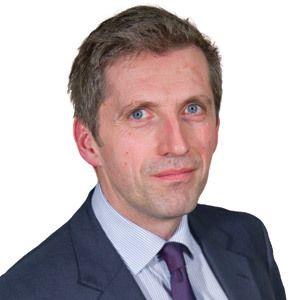 2015 saw several new names crop up in senior litigation and regulatory positions at other major banks, including Wilson Thorburn, who left JP Morgan to become GC for group litigation, regulatory and competition legal at Lloyds Banking Group, replacing Philippa Simmons. 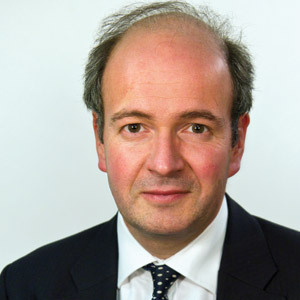 Thorburn’s arrival preceded the announcement that Lloyds GC, Andrew Whittaker, was stepping down after two years, to be replaced by his deputy, Kate Cheetham, in May. Cheetham will eventually report to outgoing Linklaters’ managing partner, Simon Davies, who is joining the bank in January 2016 as chief people, legal and strategy officer. 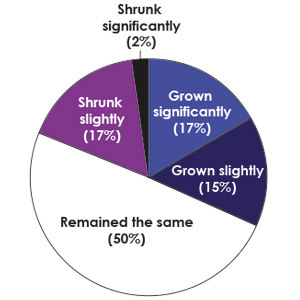 Of those surveyed, a third stated that their in-house litigation teams have grown in the past two years, while 50% have remained the same size. In addition, when it comes to recruitment of in-house counsel, the banks are fishing from a much larger talent pool, including rival banks, private practice firms and the regulators themselves. There is also a growing acceptance by other departments within banks that legal and regulatory issues are critically important to what they do. As other departments increasingly grapple with the regulatory aspects of their business, the reverse is true of the lawyers, who are now more focused on how the wider business fits into the changing regulatory landscape. This in-depth understanding of the business is something in-house lawyers expect from their external counsel as well, particularly in the wake of increased regulatory scrutiny. In the most high-profile regulatory and civil cases, these relationships will go to the very top. This is reflected in the way that banks like Barclays are giving their senior litigators prominent leadership positions and why high-profile private practice lawyers such as Davies at Linklaters would consider an in-house position at Lloyds. For those seeking a challenge, the exposure that senior in-house litigators are now getting to the top echelons of the business is clearly appealing. While the pressure remains high, there is a subtle difference between the volumes of claims and regulatory investigations that our 86 respondents expect to see, and expected costs. While 41% percent expect to see civil claims grow, only 18% are allocating more funds to forthcoming litigation costs and settlements. 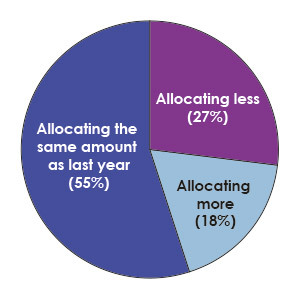 Similarly, while 35% expect the number of regulatory investigations they are involved in to grow, only 18% are allocating more funds towards regulatory fines. This in part reflects a view that, given levels were very high to start with, the overall value of fines and settlements can only go down. This can already be seen with PPI settlements, where FCA-reported payouts to customers were down to £300.5m in August, the lowest monthly figure since September 2011. Now that the FCA has announced a deadline of 2018 for PPI settlements, the end is quite literally in sight. The internal legal and regulatory infrastructure that the banks and financial institutions have is also considerably larger and more sophisticated than only a few years ago (see ‘Banking on trouble’ above). 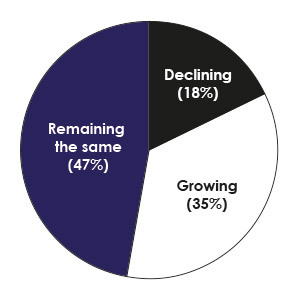 Thirty-one per cent of respondents’ in-house teams have grown in the last two years, while 50% are unchanged. That financial institutions have seriously invested in these areas has gone some way to improving their relationship with the regulators. Compared with last year, is your institution allocating more funds to meet forthcoming litigation costs and settlements? 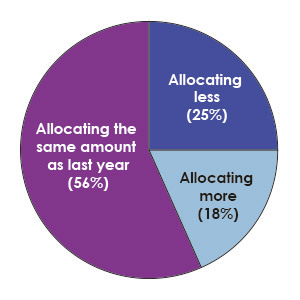 Compared with last year, is your institution allocating more funds to meet regulatory fines? The most dramatic example of this softer approach was the recent watering down of the Senior Managers Regime (SMR), which is hitting banks in March 2016 to increase the individual accountability of senior managers. Initially the SMR had a ‘presumption of responsibility’, where senior bankers had to prove that they took such steps as a person in their position could reasonably be expected to take to prevent regulatory breaches. This reverse burden of proof has now been dropped and the regulator will now have to prove that the senior bankers failed to ‘prevent regulatory breaches in the areas of the firm for which they are responsible’. While the SMR has been pulled back slightly, its introduction to UK banks next year, and the wider UK financial services market in 2018, demonstrates a long-heralded shift towards greater personal accountability. This hasn’t gone unnoticed at the banks, where 96% of respondents felt that the regulatory focus on an individual’s accountability has increased. According to one bank’s head of litigation, this was a case that ‘nobody saw coming’. Despite humble origins, its precedent-setting verdict could result in banks facing a flood of additional payment protection insurance (PPI) claims. The claimant was Susan Plevin, who took out a £34,000 loan in 2006 from Paragon. She also took out £5,780 in PPI coverage, not knowing that 71.8% of the premium went towards commissions to Paragon and LL Processing (LLP), a credit broker that arranged the loan from Paragon. In January 2009, Plevin brought proceedings against LLP and Paragon. The claim against LLP was settled in 2010 for £3,000. The claim against Paragon went to the Supreme Court, which in November 2014 ruled that Paragon’s relationship with Plevin was unfair because the lender had not disclosed the commission. The banking industry is currently awaiting guidance from a Financial Conduct Authority (FCA) consultation on the Plevin judgment. In the worst-case scenario, it could open the floodgates for further PPI claims focusing on similar ‘unfair relationships’ and undeclared PPI commissions. For Plevin: Miller Gardner Solicitors; Hodge Malek QC and James Strachan QC (39 Essex Chambers); and John Campbell SC (4-5 Gray’s Inn Square). For Paragon: Irwin Mitchell; Jonathan Crow QC (4 Stone Buildings); and Ian Wilson and Sandy Phipps (3 Verulam Buildings). The 14-year prison sentence – with a minimum of seven years’ prison time – given to former UBS and Citigroup derivatives trader Tom Hayes in August, for manipulating Libor rates, certainly caught the City’s attention. Hayes was the first person to be convicted over the rate-rigging scandal, though another trial alleging fraud against a further six ex-brokers started in October in Southwark Crown Court, as have separate trials against traders in the US. Coupled with the imminent introduction of the FCA’s Senior Managers Regime, Hayes’ sentence marks a new era of personal accountability for banking staff. For the Serious Fraud Office: Mukul Chawla QC (9-12 Bell Yard); Andrew Onslow QC (3 Verulam Buildings); and Max Baines and Gillian Jones (Red Lion Chambers). For Tom Hayes: Cartwright King Solicitors; Neil Hawes QC (Charter Chambers); and Christopher Convey and Catherine Collins (33 Chancery Lane). The scandal surrounding the manipulation of Libor and the alleged mis-selling of interest rate swaps has resulted in a slew of claims and test cases. One of the largest was Graiseley Properties & ors v Barclays Bank & ors, a dispute that was settled on the eve of trial in 2014. But Graiseley owner Gary Hartland remains a thorn in the banking industry’s side. Another of his companies, Wingate & Associates Realtors, is pursuing a claim against Lloyds Bank attempting to overturn a previous settlement made with the bank in 2011, following the revelation that Lloyds was involved in Libor rigging. Should the claim succeed, it would likely lead to other settlements being reopened. Similarly, an Indian property company Unitech was allowed to amend its mis-selling claim against Deutsche Bank to factor in Libor manipulation. Another major case is Property Alliance Group v The Royal Bank of Scotland, set for trial in June 2016. Here, The Royal Bank of Scotland (RBS) has already suffered a pre-trial setback after being ordered to turn over confidential regulatory reports concerning its alleged manipulation of Libor. However, it hasn’t all gone against the banks: the first mis-selling trial in 2013 saw RBS defeat a claim brought by property developers John Green and Paul Rowley, who were subsequently refused leave to appeal. More recently, in Crestsign v National Westminster Bank & anor, the defendant banks avoided liability for negligent advice because of their contractual terms and conditions. Crestsign has, however, been granted an appeal, which will be heard in 2016. For Property Alliance Group: Cooke Young & Keidan; Tim Lord QC and Kyle Lawson (Brick Court Chambers); and Adam Cloherty (XXIV Old Buildings). For RBS: Dentons; David Railton QC and Adam Sher (Fountain Court Chambers). For Wingate Associates: Hausfeld; Stephen Auld QC (One Essex Court); and Farhaz Khan and Miranda de Savorgnani (Outer Temple Chambers). For Lloyds Bank: Hogan Lovells; and Richard Handyside QC (Fountain Court). For Deutsche Bank: Freshfields Bruckhaus Deringer and Allen & Overy (A&O); Mark Hapgood QC (Brick Court); Timothy Howe QC, Richard Handyside QC, Adam Zellick and Adam Sher (Fountain Court). For Unitech: Stephenson Harwood; Thomas Sharpe QC and Michael d’Arcy (One Essex Court); and John Brisby QC and Alastair Tomson (4 Stone Buildings). For Crestsign: Slater and Gordon; Richard Edwards (3 Verulam Buildings). For RBS and NatWest: DLA Piper; Andrew Mitchell QC (Fountain Court); and Laura John (3 Verulam Buildings). Set for trial in December 2016, the £4bn+ shareholder claim against RBS and its former directors is undoubtedly one of the largest to ever hit the UK courts. The claim concerns the bank’s £12bn rights issue in April 2008 where shares were sold at £2 each. The claimants argue that the prospectus was defective and contained material misstatements and omissions. Unsurprisingly, RBS’s legal fees are racking up, with Herbert Smith Freehills’ costs for the initial trial anticipated to be around £90m. The case is seen by many as setting a precedent for US-style group actions in the UK, and a similar claim has since been made by shareholders against Lloyds Bank and its directors concerning its 2008 takeover of HBOS. For RBS: Herbert Smith Freehills; David Railton QC and James McClelland (Fountain Court), David Blayney QC and Simon Hattan (Serle Court); and Sonia Tolaney QC (3 Verulam Buildings). For RBS Shareholders Action Group – Signature Litigation; and Jonathan Nash QC, Peter de Verneuil Smith and Ian Higgins (3 Verulam Buildings). For a group of over 70 institutional investors – Stewarts Law; and Andrew Onslow QC, Adam Kramer and Scott Ralston (3 Verulam Buildings). For RBS Rights Issue Action Group – Leon Kaye Solicitors; and Michael Lazarus (3 Verulam Buildings). For major institutional investors: Aviva, Legal & General Group, Prudential, Standard Life, and Universities Superannuation Scheme – Quinn Emanuel Urquhart & Sullivan; Laurence Rabinowitz QC and Maximilian Schlote (One Essex Court); and Alex Barden (Erskine Chambers). For nine pension investment subsidiaries of Lloyds Banking Group, including Scottish Widows and Halifax Life – Mishcon de Reya. The second half of 2015 saw US-based banks make several multibillion-dollar settlements following investor class actions. In September, Quinn Emanuel helped one group of investors reach a $1.87bn settlement with 12 major banks, as well as the data provider Markit and the International Swaps and Derivatives Association (ISDA). The investors alleged that the defendants conspired to manipulate swap rates and blocked competitors from entering the credit default swap market. US litigation specialist Scott + Scott also led a class action accusing 16 banks of widespread Forex manipulation. In October, a settlement was reached with five banks, including Barclays, HSBC and RBS, which respectively paid out $384m, $285m and $255m. Scott + Scott is in the process of opening a UK office. While the firm awaits its licence to practise, it has instructed Daniel Jowell QC of Brick Court Chambers to prepare a UK action against several banks for Forex manipulation. For the defendants: Bank of America – Davis Polk & Wardwell; Morgan Stanley – Cravath, Swaine & Moore; JPMorgan Chase – Skadden, Arps, Slate, Meagher & Flom; Goldman Sachs – Sullivan & Cromwell and Winston & Strawn; Citibank – Sidley Austin; Deutsche Bank – Jones Day; Credit Suisse – Hogan Lovells; BNP Paribas – A&O; RBS – Cadwalader, Wickersham & Taft; HSBC – Mayer Brown; Barclays – Cahill Gordon & Reindel; ISDA – Simpson Thacher & Bartlett; Markit – Proskauer Rose. For the banks: Barclays – Sullivan & Cromwell; HSBC – Locke Lord; RBS – Davis Polk & Wardwell; BNP Paribas – A&O; Goldman Sachs – Cleary Gottlieb Steen & Hamilton. The increase in personal accountability gives the FCA a far bigger stick with which to achieve its main goal of getting banks to improve their culture. Many in-house counsel believe the challenge is as much a behavioural issue as a legal one. Do you plan to use any of the following in the near future? Has your institution’s in-house litigation team grown in the last two years? What is the biggest disincentive to litigation? What describes your institution’s approach to litigation? When it comes to the growth in civil claims aimed at the industry, much of this stems from the time it has spent under the regulatory spotlight. 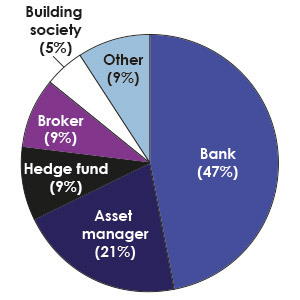 This is evident with the asset managers and hedge funds, where 46% and 67% of respondents respectively expect to see their claim volumes grow. For the banks, the full fallout from their Libor and FX rigging issues has yet to properly play out in the UK courts. Forty-three percent of respondents felt that benchmark manipulation and mis-selling issues will increase the volume of claims made against them. Whether these claims will succeed and what form they will take is another matter. When it comes to FX-related mis-selling claims, while there have been major group actions and settlements in the US, the success of this approach in the UK is still unknown. US claimant law firms such as Scott + Scott and Hausfeld have established themselves in the UK and made it clear that they plan to pursue FX group actions. Unsurprisingly, 67% of banks surveyed see class actions and group litigation as being a growing issue. The manipulation of Libor has also given extra life to interest rate swap mis-selling claims brought against the banks, such as Deutsche Bank and others v Unitech Global, which was adapted to allow for Libor rigging (see ‘A message has been sent’, pages 58-59). It remains to be seen, however, whether such cases will make it to a full-blown trial or simply settle out of court. 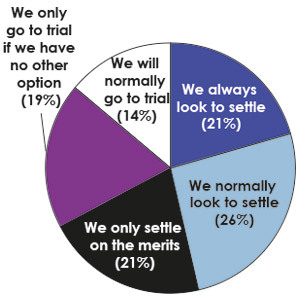 In the survey, 19% of respondents said they would only go to trial if they had no other option, while a further 47% would typically look to settle. 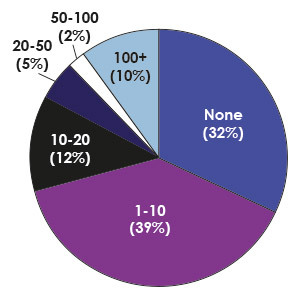 For 42% of respondents, costs are the biggest disincentive to litigation. 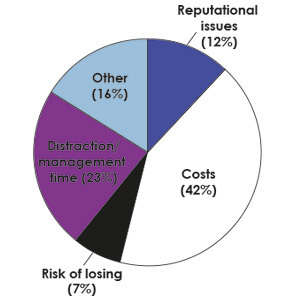 Only 7% see the risk of losing as a disincentive. In the past, banks may have been inclined to settle, even when they had a good case. The reality now is that banks are forced to and willing to litigate the right cases. One factor that favours litigation is the high esteem in which most hold the UK court system, with 88% of respondents agreeing that the courts usually get it right. The cost and duration of such cases are, however, a disincentive and it is hoped that recent initiatives such as the October launch of the Financial List, will help address this. The List is dedicated to complex banking disputes valued at over £50m, and offers an even mix of ten specialist Chancery and Commercial Court judges all highly experienced in major financial disputes. ‘Financial disputes work is probably one of the busiest areas in current times and that seems likely to continue. The Financial List was a recognition of that position and the specialist nature of many of the disputes,’ says Sonia Tolaney QC of 3 Verulam Buildings, who led the List’s consultation process on behalf of the Commercial Bar. One significant attraction is its Financial Markets Test Case Scheme, which will allow parties to resolve uncertain points of law with a hypothetical set of facts. How much do you expect your institution to spend on settling conduct and litigation charges over the next two years? A significant by-product of the List was the simultaneous launch of the Shorter and Flexible Trial Procedures pilot scheme, which is open to less complex commercial claims, where there is no need for extensive disputes over facts and less need for extensive disclosure. As with the Financial List, a key component will be the presence of a docketed judge for the entirety of the dispute. ‘The idea is that because you have a docketed trial judge managing the case from day one through to the trial, the judge is able both to review and police each procedural step taken and, as a consequence, assess the resulting legal costs on a summary basis, having given judgment,’ says Ed Crosse, a financial disputes partner at Simmons who was the solicitors’ representative on the shorter and flexible trials committee. The pilot schemes were partly influenced by a successful fast-track procedure in the Australian commercial courts, as well as a similarly successful initiative in the UK’s Intellectual Property Enterprise Court (IPEC), which helped speed up intellectual property claims. Mr Justice Birss, who was a key driver behind the success of IPEC, is currently chair of the shorter and flexible trials committee. For the flexible trials scheme, lessons have also been learnt from arbitration. While the courts can’t compete with arbitral tribunals when it comes to confidentiality, the view is that the pilot scheme will prove that when parties agree, the courts can adopt the more flexible case management procedures used in arbitration. Statistics based on information obtained from public sources by Bloomberg’s court service. Pleadings not yet available for all cases. Statistics therefore include cases identified on basis of parties’ names only. 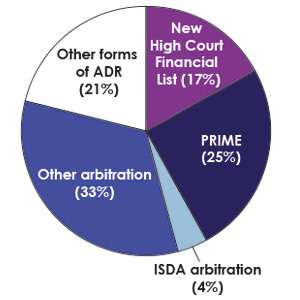 Arbitration is one of the more popular forms of dispute resolution, with 30% planning to use it in the future, as are other more specialised forums such as PRIME Finance, a Dutch-based arbitration system set up to resolve complex derivatives and finance disputes. Mediation is also popular and Day says Santander uses it extensively for disputed commercial contracts. Whichever route financial institutions take, demand on all of these forums will remain high. The crippling penalties might be waning, at least for those with decent internal measures in place, but new regulations will open financial institutions up to new sources of disputes. These won’t just come in the form of traditional stumbling blocks, such as fraud and mis-selling, but in new areas such as data protection and competition, which for UK-based financial institutions has come under the auspices of the FCA and its concurrent powers with the Competition and Markets Authority. And then there could be a black swan that catches everyone by surprise. 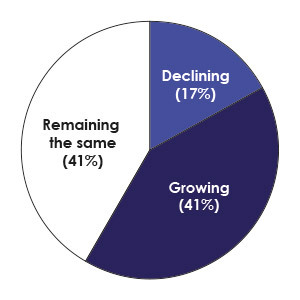 The survey results indicate that a majority of respondents see actions seeking collective redress as a growing (or rapidly growing) issue. This reflects Simmons & Simmons’ recent experience. We have seen a significant growth in the number of enquiries related to such actions, particularly from amongst our asset management clients who are keen to understand what obligations they have to consider participation in such actions on behalf of their investors (if any) and the internal policies and procedures required to manage that process. 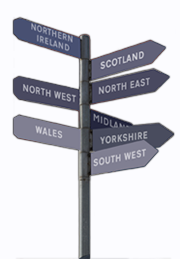 It is difficult to predict whether collective redress procedures will take off in the UK in the same way as they have in other jurisdictions and, if so, how they will ultimately affect our clients. However, it is clear that actions seeking collective redress are already becoming more commonplace, and a significant success in any of the current high profile collective actions in the UK, coupled with the continued establishment of a strong claimant bar and credible litigation funding options, could well precipitate their rise. The FCA has long expressed the desire to hold senior individuals to account. However, only now does it seems to feel that it may be beginning to have the tools to achieve that. The fact that a significant majority of survey respondents noted an increased (or much increased) regulatory focus on the accountability of individuals suggests that the message is getting through and it reflects what we have been seeing in practice. The Senior Managers Regime (SMR) is clearly designed to complete the toolbox, with more clearly defined duties, statements of responsibility and responsibility maps all designed to lay trails for the regulator to follow. The reversal of the burden of proof would have made breaches easier to prove but the Government's decision at the lat minute to do away with that does not make it less likely that the FCA and PRA will press ahead where the consider it appropriate to do so.